"The Politicization of Judicial Elections and Its Effect on Judicial Independence" by Matthew W. Green, Jr. 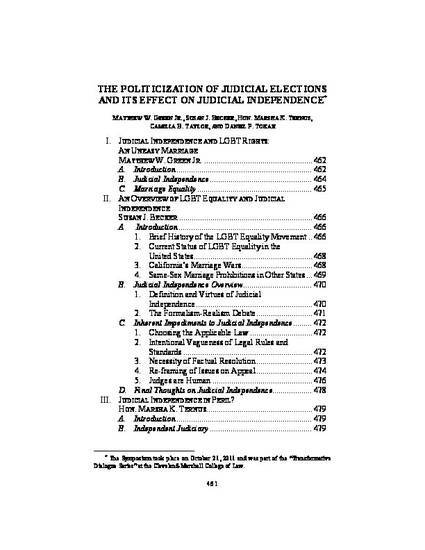 This article presents the proceedings of the Cleveland-Marshall College of Law Symposium, The Politicization of Judicial Elections and Its Effect on Judicial Independence and LGBT Rights, held October 21, 2011. The idea for the conference stemmed from the November 2010 Iowa judicial election, in which three justices were voted out of office as a result of joining a unanimous ruling, Varnum v. Brien, that struck down, on equal protection grounds, a state statute limiting marriage rights to heterosexual couples. The conference addresses whether the backlash that occurred in Iowa after the Varnum decision might undermine judicial independence in jurisdictions where judges are elected. Daniel Takoji, professor of law at the Ohio State University's Moritz College of Law, discusses, the role of money in judicial elections and more broadly its effect on judicial independence. Cleveland-Marshall College of Law Professor Susan Becker provides an overview of the struggle for LGBT rights, and discusses various factors that likely have influenced and will continue to influence judicial independence when addressing LGBT rights. Camilla Taylor, of Lambda Legal, who successfully litigated the Varnum decision through the Iowa courts, discusses her efforts in Iowa prior to litigating the Varnum case and whether the backlash that occurred after Varnum might affect Lambda's efforts to challenge laws affecting LGBT rights in other states where judges are elected. The Hon. Marsha K. Temus recounts her experience and offers her unique perspective on whether politicized judicial elections might undermine judicial independence. The article at 60 CLEV. ST. L. REV. 461 omitted the following footnote at p. 502, line 19: The data on spending in this paragraph comes from OpenSecrets.org. Election Stats, 2010, supra note 147. This omission was due to an error in the editorial process and was not a product of the author. The editors apologize for the error.